One day cruise Visit of Oia or Transfer to Santorini: There are no words that can aptly describe the island of Santorini, the destination of this 1 day charter. This unique volcanic island with its breath-taking views, world-renowned spectacular landscapes, beautiful black and red beaches and must-see traditional villages will enthral you. Do not miss the village of Oia (11 km north of the capital Thira). Built on tall cliffs, Oia is by far one of the most beautiful and picturesque villages of Santorini, famous for its stunning sunsets, quiet life and remarkable architecture. This charter will offer you not only a luxurious sea getaway, but also an unforgettable experience. Schedule: Embarkation: 9.00 am, Mykonos Tourlos port or Ornos bay, return to Mykonos Island during sunset. 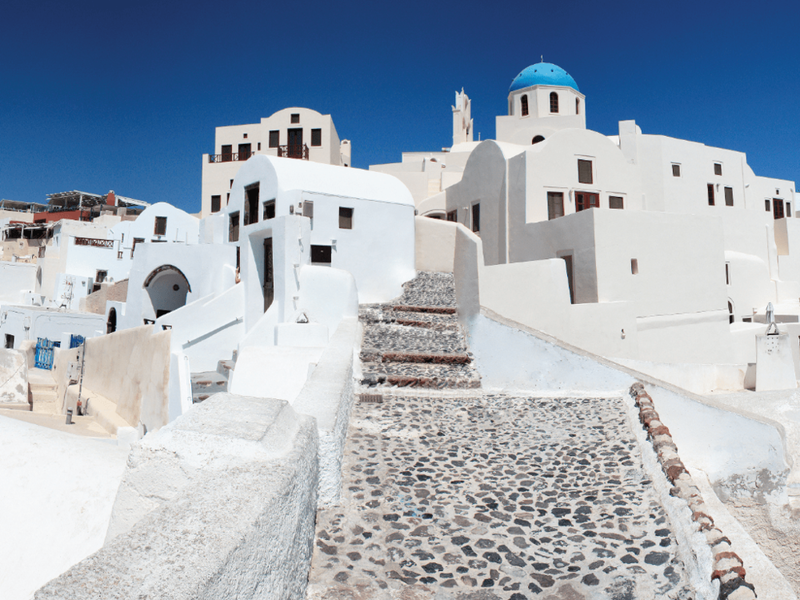 Santorini is about 70 miles from Mykonos (approx.3 hours of nautical travel). Possible swim stops on your way: Paros Island - Monastiri or Kolimbithres bay, where one can enjoy lagoon like waters or at Ios Island, at Maganari Bay, situated on the Southern coast of Ios. Upon arrival at Amoudi bay, in Santorini, your yacht will ancher and transport to land is done per yachts’ tender or local caique, should there be winds in the bay or multiple luggage transport (in the case of transfer). Transport to Oia village, is of 15 minutes by taxi or mini bus, arranged by L’O Yachting or by representative agent. Charter fee includes 6 hours of required petrol consumption*. For a swim stop in the volcanic area of Caldera and additional hour of petrol consumption is required. All beverages and snacks are included in the charter fee. *If during transfer more than 6 hours of petrol consumption is consumed client will be notified by our captain. Yacht will be rendered full tank and shall be redelivered full tank by client.